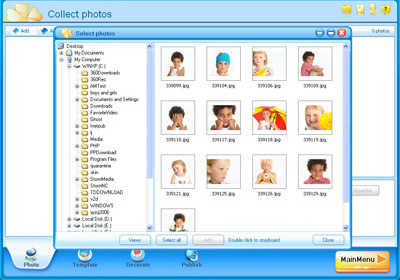 > Support > User Guide > How to use Flash Gallery Creator Deluxe? Step 1 Create a new slideshow project. Step 2 Import your favorite photos. Step 3 On "Template" page, choose a template you like, or keep blank. If you need a background music, click button to add it. Step 4 Publish your slideshow. 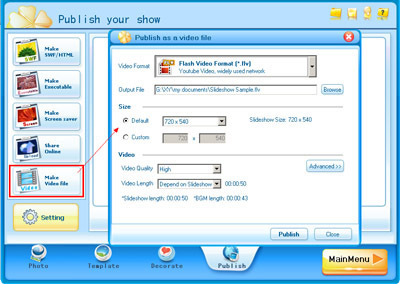 Go to "Publish" page, choose "Make Video file", you will see a video output setting window. 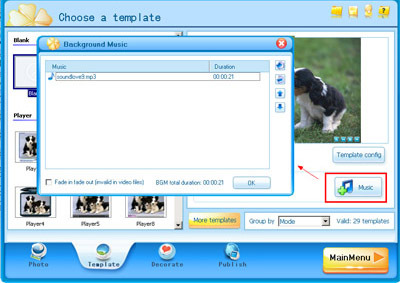 Select a proper format from the drop-down list of "Video Format" and then click button.